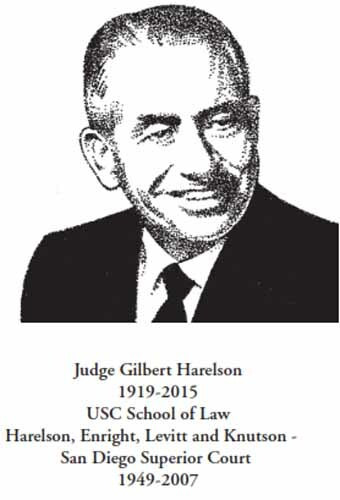 For more than 50 years Judge Gilbert Harelson served the legal community and the community of San Diego with dedication, diligence and integrity. Judge Harelson was born and raised in Glendale, Arizona. Gilbert attended University of Arizona and was a member of his beloved fraternity Sigma Chi. He received his law degree from the University of Southern California and remained a loyal Trojan fan. After graduation from USC in 1949 Judge Harelson was a deputy attorney general for the state of California in Los Angeles and then district attorney in San Diego. From 1959 -1970 he was city attorney of La Mesa with the partnership of Harelson, Enright, Levitt and Knutson. He was appointed to the Superior Court in 1970 by the then Governor Ronald Reagan, elected in 1972 and reelected in 1978 and 1984. He was presiding judge in 1981 and 1982. In 1987, after 17 years on the bench Judge Harelson retired. Wanting to still be active in the legal community he joined Judicial Arbitrations and Mediation Services INC (J.A.M.S.) where he served until 2007. Judge Harelson’s even courtroom demeanor, decisiveness, and sense of fair play, along with his quick quit and humor, have made him one of the most respected and liked members of the judiciary. It has been said that he is the mold from which judges should be cast. The San Diego Trial Lawyers Association named him Outstanding Judge of the Year in 1982 and presented him with the Judicial Achievement Award in 1983. Commitment to his community was an integral and ongoing aspect of Judge Harelson’s life. He was vice chair of the San Diego Civilian Advisory Panel on Police practices and served on the San Diego Stadium Authority. He was a member of the County of San Diego’s Commission on Health Care Reform and the 1992 Major League Baseball “All Star” Game Task Force. The San Diego Junior Chamber of Commerce honored him as Legal Citizen of the Year in 1987 for his contributions to San Diego. He received the Essence of Life award from Elder Help Inc. for his numerous contributions to the San Diego community. His personal life was equally rewarding. He and his amazing wife, Henrietta, shared 70 happy years of marriage. Their greatest joy was surrounding themselves with family and friends. Gilbert was an avid golfer as well as sports enthusiast. He led a full life, even continuing driving until he was 94 years young!